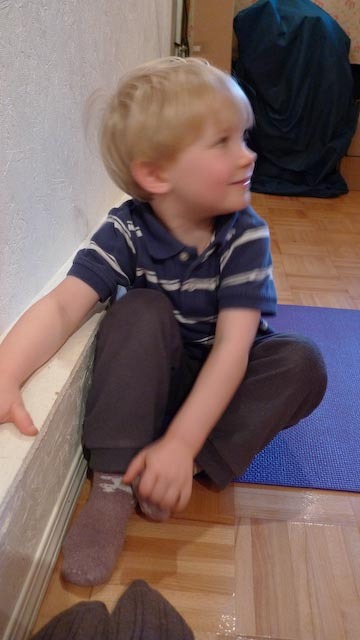 The Montessori Child at Home: Yoga in the home. Once considered by many to be weird and "foreign" , Yoga is now accepted as a beneficial form of physical and mental discipline. Many Montessori classrooms I've visited have yoga exercises as an activity and, I am pleased to say, it is an activity that is in almost constant use. The benefits of yoga are many - decrease in blood pressure, increased flexibility, improved hand-eye coordination - but I am not an expert on the subject so will let you do your own research to discover those (and other) benefits. I have observed, however, that yoga in the classroom serves many children as effectively as any of the other activities on the shelves. 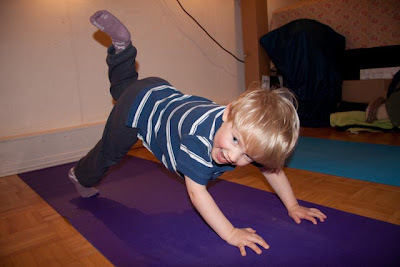 In the classroom, the Yoga activity is presented by the teacher to one or two children at a time. The materials required are just a yoga mat and a few pose cards. Once the children have been shown how to do the yoga poses, they are welcome to unroll the mat and choose a few poses to practice when ever they want. 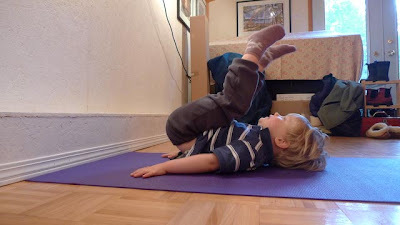 Yoga is easily transferred from the classroom ( or the Yoga studio) to the home and can be done by a child alone or with an adult. I like the thought of a child having his own yoga mat and his own cards so that he can practise at whim or join in when his parents are practising. With all that said, here are some pictures of M. at home with his yoga mat. 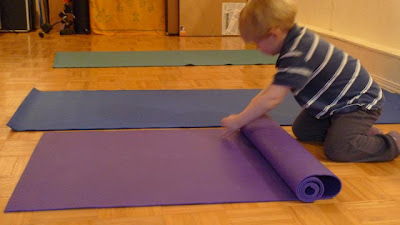 M. has already learned how to roll and unroll a work mat in the classroom so transferring that skill to a yoga mat is easy. Then he takes off his shoes - just like in the classroom. And begins to practise his poses. Look at the joy on his face! What a great way to get in a little activity and a lot of fun. These are not classes for Yoga students with ailments, or for beginners who just "jumped off the couch." Power Yoga is a fantastic system of Yoga exercises, but if you are going to teach any form of Power Yoga classes, you have to be completely honest with prospective students. Thanks for your thoughts, kaney. This post was not about Yoga classes but is about one of our students and how the Montessori Philosophy is incorporated into their home life. However,any good Montessori teacher will observe her children and adapt any activity or material to fit the child if need be. This goes for Yoga, as well. I should also point out that Yoga in the classroom is not a "standard" Montessori activity and it won't be found in every classroom. Where did you get your cards? I've been told that cards can be purchased although I don't know from where. 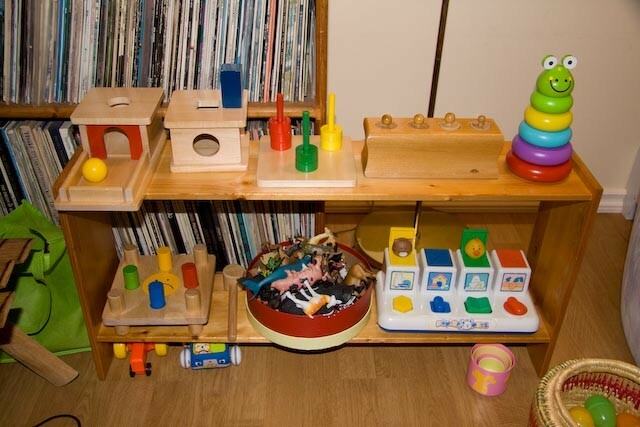 (You might want to check montessoriservices.com ). Most teachers just make their own either using their own children as models or getting permission to take pictures of the students. I also know of one teacher who bought a yoga book from a thrift story and used the pictures that she found in the book. I'm writing to Montessori-related blogs to share a new material idea, and to gauge interest from the educational community. I'm a former Montessori-child (Brookview Montessori in Benton Harbor, MI) and now have my own children (twin two-year old boys). I've been working with my Mother, Lisa Camp, a Montessori teacher for 25 years, on an extremely durable, beautiful set of alphabet cards for small children to work and play with. My mother deems them both “classroom grade” and “indestructible”. The cards are made from non-toxic, food grade plastic and inks (made in the United States). The cards offer 26, A to Z original illustrations by Australian artist, Marc Martin. An important note: The A, E, I, O and U main illustrations have all been updated to objects with short vowel sounds since the release of our video and initial mock-ups. No soft “G” sounds either. The backs of the cards have also been updated to feature a large display of the lowercase letter with small illustrations of other matching objects surrounding it. They are safe for teething babies for use as stroller cards, and will grow with your child to help them spell out words while they are learning to read. For any blogs or websites who feature our Kickstarter link, we will offer a free deck of cards once they are funded and produced, please let me know if you have any questions or comments! This is such a joy for me to see Yoga being introduced in a Montessori classroom. I too, am a Montessori educator. I used to practice Yoga in my classroom regularly. I helped make the classroom's climate very peaceful. From my experiences working with the kids, I was able to publish a children's book on Yoga, last year. Please check out my book, titled, Y is for Yoga by Anita Adgikary.....cheers to you ! Starting kids with yoga in the home at a young age is a great idea. But if you're a cautious parent do yourself a favor and invest in a Kulae Hot Hybrid yoga mat. These mats are very soft, machine-washable, and serve as a great hybrid between a yoga mat and a yoga towel. Highly recommended!